Today is my Friday. Yes, I know, how do I get so many days off in a year? I swear, working for healthcare can be a blessing and a curse. The blessings include outstanding benefits - one of which is our time off program. Even when I'm good about taking my time off, I continue to accrue more, so then I get close to my cap and well, that's where I've been at lately, so I am sneaking in another couple of days this week to have a nice little "spring break" if you will. I won't take anymore time until May, when I plan to have a garage sale and then after that it will be sometime this summer. I am most definitely not complaining though! 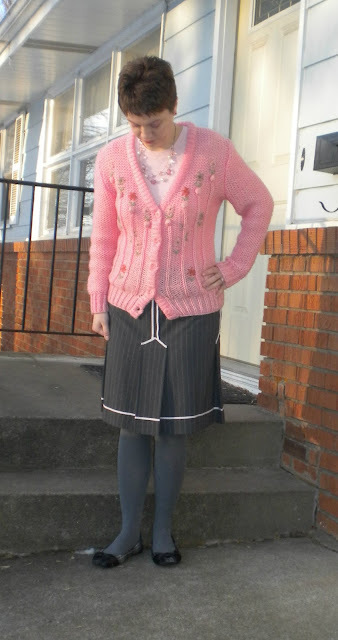 How adorable is my new vintage sweater from the fabulous Amanda's Salvaged Strawberry shop? She had put this on sale a few weeks back and I mentioned I wished I wasn't on a shopping ban so I could add it to my closet and then she kindly set it aside for me! She had it all ready for me at the Tandem Vintage sale this weekend. She's just the best. 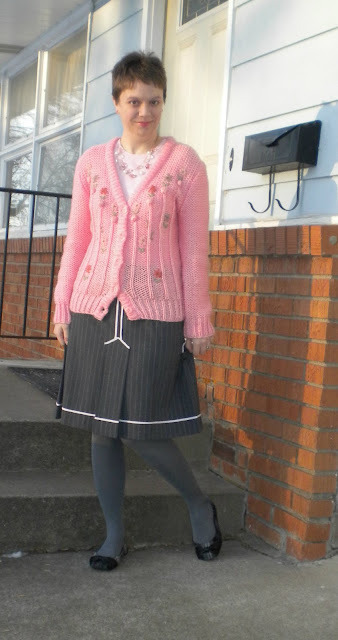 And this sweater just makes me smile, it's so springy and girly and fun. Speaking of shopping bans, I'm technically done with mine. Some say that what you give up for Lent ends at Palm Sunday and some say it goes through Easter Sunday. Either way, I'm done. BUT what I'm not done with is trying to just take a real budget cautious approach to my shopping. I'm also only going to add pieces that I feel complete my wardrobe for the upcoming spring/summer. I have a small list of things I want and I'll slowly start looking for and adding them. We have some big home improvement projects coming up this spring and so I have to be better about my spending and even with thrifting I can let it get out of hand sometimes. Maybe I'll take a clue from some of my other favorite bloggers and start a monthly budget for myself starting in April here. We'll see how it goes! Pink and grey, one of my favorite color combos! This sweater is so you and it's perfect for spring. I think it would be perfect with white pants too. I have become more selective in my shopping habits whether retail or thrifting. I keep a list in my purse and stick to it. It's been in there since the holidays. There are about 4 more items that I have been looking for, but that's it. Super fun sweater!! It brightened up my day!! And a budget is a really good idea!! Cute sweater. It was so nice she saved it for you post-ban! 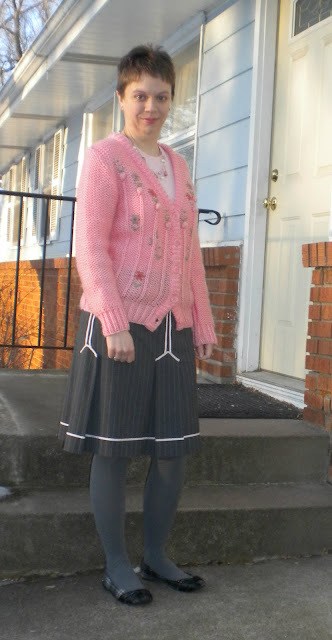 Cute outfit and lovely blog girl!! You get more time off than anyone else I know! :) I do the same thing, I make a list of items I think would add nicely to my wardrobe and I try to stick to it when going shopping. I love that sweater! Very pretty. Love the pink. Yay for time off! I am in the medical field too, and I know what you mean! Great goals on spending Bethie. You are doing great. Glad your friend held the cutest sweater for you. Yes, thank you for the compliment on my unique necklace. I LOVE IT!!!!!! Hooray for Pink! I am jelly of your days off, I REALLY wish I had more! You look do pretty in pink, Bethie. :) Great sweater. self-imposed budgets don't work for me. i always just have to keep in mind not to spend too much, but if i really want something, i allow it. moderation, i suppose!! either way, i'm glad your ban is over!! good for you, Beth! And you look absolutely cute in that sweater!!!! I love the color and the cute little details! A little time off now and again is such a great chance to refresh! I'm jealous! And that sweater is wonderfully adorable. I love the bright color and the vintage vibe. It has a lot of personality to it! So so cute! This look is very you, the sweater looks perfect with that skirt. All the pink really shines. I've been crashing through any kind of budget lately, I need to reign myself back in, sew, craft, do anything other than shop. So cute! I love that sweater! It looks so comfy! What a beautiful sweater! How sweet that she set it aside just for you. It looks darling on you and has such fun detail. Hope you have a great couple of days off!